Producers: 4,238 smallholder farmers (1,707 women; 2,531 men) in 16 secteurs. 2 of 7 board members are women. Post-harvest process: Fully Washed from 3 central washing stations, also farmer-washed; raised, mesh drying tables with shade nets; cupping lab and trained cupper. Certifications: Fairtrade, Organic. Achieved organic certification in January 2017. From 350 founder members in 2009, the co-operative has grown to over 4000 members by 2017. 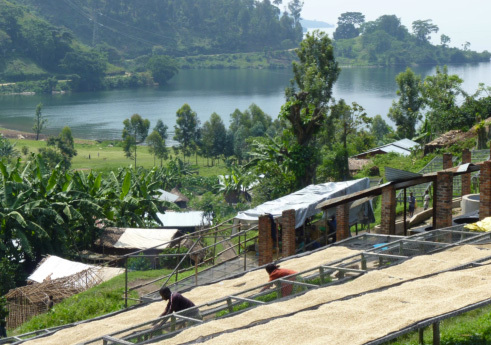 They are producing specialty fully-washed Arabica in the mountains of Eastern Congo, against the backdrop of Lake Kivu. Click here for a hand-drawn map from Muungano of the different coffee communities. Muungano’s farmers are establishing a strong reputation among specialty coffee aficionados for their Fully Washed Arabica coffee. They have invested in coffee nurseries and built community-level washing stations; and they are renovating the land by planting new seedlings and harvesting the coffee scrupulously. Muungano has three coffee washing stations and a fully-equipped cupping lab with an internationally trained cupper. Farmers tend to the land naturally, using homemade compost and mulch. Since the coffee is interspersed with villages and homes, they see this as important for people’s health as well as the environment. In January 2017, Muungano’s farmers achieved organic certification. The farmers are taking measures to combat the risks of landslides in heavy rain, including planting trees with deep roots to strengthen the soil structure.